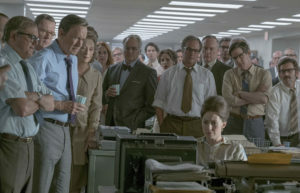 SPJ members, local journalists and guests are invited to the 7:10 p.m. screening of The Post on Tuesday, Jan. 30, 2018 at Cinemark Movies 12 – Carriage Place, 2570 Bethel Rd. Just show us an ID from a working-media organization or your SPJ membership card for free entry to the movie! Guests can join for $5. Relax in the new theater reclining seats while watching a movie that already has won the AFI Movie of the Year and several other best picture awards and is nominated for many others yet to be given. Attendees are invited to an informal discussion about the film at Winking Lizard, 1380 Bethel Rd., anytime after 9:30 p.m. Please RSVP so we can reserve enough tickets! Click here to reserve your seat on Eventbrite. The movie starts at 7:10 p.m., but please plan to arrive starting at 6:45 p.m. to pick up your tickets and get seated!